IN A WORLD that is becoming increasingly more aware of the value of someone’s personal data, Ireland is in the midst of its own scandal involving the country’s biggest media group. Caught up in this story are high-profile names such as journalist and TV presenter Brendan O’Connor and investigative journalist Maeve Sheehan, who were unaware their data was allegedly probed by an external company in a different jurisdiction. 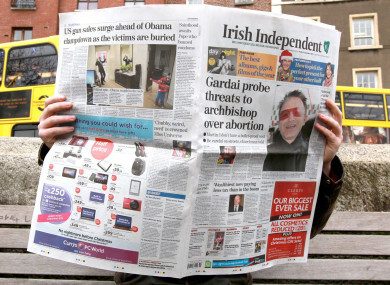 Independent News and Media’s largest shareholder and businessman Denis O’Brien features. The #INM19 hashtag has been doing the rounds on Twitter over the past few days, as details have emerged about a number of journalists and senior staff at Independent News and Media whose emails were allegedly accessed by an external company. Moreover, it is alleged that this data interrogation was ordered by the then-chairman Leslie Buckley of the company, but that the board had no idea it was going on. The Data Protection Commissioner, Helen Dixon, intends to undertake an investigation into the suspected data breach – a move welcomed by the National Union of Journalists. In a statement issued this evening, Séamus Dooley, the Irish Secretary of the NUJ, said: “INM employees require a detailed explanation as to how and why the alleged breaches occurred. The long-term interests of workers and of INM are best served by an open and transparent process. Let’s break down what’s been happening. The recent furore was sparked by INM’s ill-fated bid for radio station Newstalk. The Office of the Director of Corporate Enforcement is the State’s corporate governance watchdog, with powers to investigate companies suspected of contravening the law. It has been dealing with INM – which publishes the Irish Independent, Sunday Independent, Herald and other newspapers – for some time. In March 2017, the ODCE asked INM to “produce books and records” in relation to INM’s reported takeover bid for Newstalk. This came following a protected disclosure from former INM CEO Robert Pitt in relation to the bid. It had been reported that Pitt had disagreed with then-INM chairman Leslie Buckley over the price that should be paid for Newstalk. Pitt had suggested a valuation of €12 million but the radio station’s parent company Communicorp had designated a valuation of €30 to €35 million. Buckley, a long-time close associate of Denis O’Brien is alleged to have told Pitt that another valuation of €14 million was “insulting to the majority shareholder”, the Irish Times reported today. Communicorp is almost wholly owned by Denis O’Brien, who is also the largest shareholder at INM. What has the ODCE been saying in the past few weeks? On 23 March this year, the ODCE issued notice to Independent News and Media that it would be seeking to appoint inspectors to investigate corporate governance at the group. To appoint these inspectors, it must make an application to the High Court, and this is expected to happen later this month. In a statement, INM said at the time in March: “Under section 748 of the Companies Act 2014, the court may appoint an inspector to investigate the affairs of a company, and to report on those affairs to the court, if the court is satisfied that there are circumstances suggesting that the affairs of the company have been conducted in an unlawful manner or on certain other specified grounds. The Board of INM is taking legal advice as to whether the Court would have sufficient grounds to make the appointment. Why is it investigating INM? As reported in the Sunday Independent last weekend, ODCE director Ian Drennan said in an affidavit filed with the High Court that there was a removal of INM’s IT system’s back-up tapes from the company’s premises. According to the affidavit, they were moved to the premises of a company outside of this jurisdiction in October 2014. Drennan said that INM data was subsequently interrogated over the course of many months. Drennan alleges in the affidavit that the data interrogation was directed by the then-chairman of INM, Leslie Buckley, who stepped down last month. The ODCE director claims that the INM board only became aware of the data interrogation exercise in August 2017. He said that Buckley said the data interrogation was part of a “cost reduction exercise” but Drennan claims that some of the output of the work “does not have any obvious connection to the cost reduction purpose asserted by the chairman”. According to ODCE director Drennan, its investigation uncovered emails containing a list of names which were to be searched for during the data interrogation. It includes current journalists, former journalists, executives, staff members and two senior counsel not related to the company. References are made in the affidavit to “email hits” against a number of the names listed. Drennan said he wants to establish “whether journalists’ email, or other data, was accessed and, if so, by whom and for what purpose”. On the board not being aware of this exercise being conducted and data being given to a third-party in 2014, Drennan describes this as “clearly problematic”. We do not yet know for sure to what extent the emails of the journalists and others involved were accessed by these third parties, and the ODCE is seeking to appoint inspectors – which would be a significant step to do so to a private company – to investigate this further. Stephen Rae, the editor-in-chief of the Irish Independent, has said he is concerned that data of journalists working for INM may have been accessed without their knowledge. In a statement to his own newspaper, Rae said the company will investigate if any data has been compromised. He said: “We have always invoked a strict protection or ‘firewall approach’ to both our journalists’ research and sources to maintain the integrity of our journalism. We will look seriously at this new information to see what data, if any, may have been involved during this reported event in 2014. The #INM19 is doing the rounds on social media at the minute, referring to the 19 people whose data was allegedly interrogated as part of this. The Irish Independent reported this morning that journalists Brendan O’Connor and Maeve Sheehan were on its list, as was former INM director of corporate affairs Karl Brophy. Also on the list were two senior counsel from the Moriarty Tribunal, which investigated matters such as the awarding of the State’s second mobile phone licence in 1995 to Denis O’Brien. Drennan said that the 19 names were found by the ODCE in an Excel spreadsheet that was attached to emails exchanged by employees of companies external to INM involved in the data interrogation. One of the names being reported as amongst the #INM19 is Sam Smyth, who now works as a columnist with the Mail on Sunday. He told RTÉ’s News at One that he had been told by someone within the media his data had been “harvested”. Smyth said no one has contacted him to say there may have been a breach of his data while he worked at Independent News and Media. 04.04.18 INM data scandal widens: Just how many people had their emails accessed? He told RTÉ that he was prominent in INM’s coverage of the Moriarty Tribunal. “I sat there for 10 years… and wrote extensively about what was going on,” he said. What does Trusted Data Solutions do? How is it involved? The Sunday Times reported last weekend that the firm that was granted access to the INM data was Trusted Data Solutions (TDS). The services provided by the Wales-based company include back-up tape services and email archive migration. However, the firm that paid the bill to TDS for its email interrogation services was not INM. It was Isle of Man company Blaydon which footed the €60,000 bill, the Sunday Times reported. It is not known why Blaydon discharged the costs associated with the services provided by TDS. During its reporting of the Paradise Papers, the Irish Times established a link between the investment holding company and O’Brien. Has this anything to do with the Red Flag case? Denis O’Brien is already engaged in a long-running legal battle with the company Red Flag consulting. The overarching case concerns an action that communications billionaire O’Brien took against the consultancy firm after a USB stick containing a dossier of information on him compiled by Red Flag was delivered to his office anonymously in October 2015. Included in this legal case is Karl Brophy, the former INM man who is now CEO of Red Flag. Brophy is also one of the #INM19. There is no indication as of yet, however, if the Red Flag case is linked to the data interrogation at INM. When approached by both the Sunday Times and the Independent, a spokesperson for Denis O’Brien did not provide comment. Editor-in-chief Stephen Rae has assured staff that their welfare is the company’s primary concern. Rae had told staff individuals from the company who had been named as having their emails searched had been informed, RTÉ reported. The issue has been taken up by the NUJ’s Séamus Dooley, who has called on INM to publicly clarify the extent to which the personal data of staff, including the confidential records of journalists, may have been compromised. He said in an earlier statement: “Every employer has a legal obligation to protect personnel records. It is imperative that INM issue an unambiguous explanation to employees about what has happened and why their data appears to have been put at risk. Clear lines appear to have been crossed and it is in the long-term interest of the company and of Irish journalism that this matter is addressed as a matter of urgency. The ODCE case to have inspectors appointed to investigate INM will be heard in the High Court on 16 April. Email “Explainer: What on earth is going on at INM?”. Feedback on “Explainer: What on earth is going on at INM?”.